Hi Bob the Canadian here. 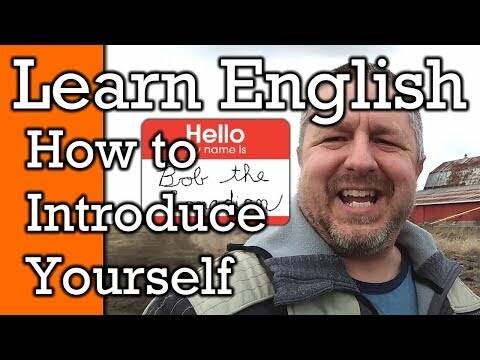 find yourself needing to introduce yourself. Well I'm pretty sure you already know how to say, "My name is….Bob the Canadian,"
who you are with a group of people. subscribe button below, and at some point during the video give me a thumbs up! So, you have to introduce yourself. and have each person introduce themselves, and say something about themselves. So, again, I'm pretty sure you already know how to say, "My name is…" or "I am…"
and if you didn't those are the two ways to tell people what your name is. My name is Bob the Canadian, or, I am Bob the Canadian. But there's a few other pieces of information that people might be interested in. So let's take a few minutes to look at each of those. because they might be different things. "I was born and raised in the city of Toronto, and I currently still live there." So that's one more additional piece of information you could give people. My name is Bob the Canadian. I was born and raised in Hamilton, Ontario and I still live there." So you could say, "I am 46 years old." like, "I'm in my late forties." or "I am around forty-five years old." or "I am in my forties." So going back to the beginning I could say, "Hi! I'm from Hamilton, Ontario and I am in my late 40's." So that's another thing, another piece of information you could share with people. You could tell them how old you are, or about how old you are. status, and whether or not you have children. Marital status refers to if you are married or not. So I might also add to my description that I am married and I have five children. So going back to the beginning, you could say, "Hi! I'm in my late forties, and I'm happily married and have five children. The other thing you might wanna share with people is what you do for a job. worker, I am a truck driver, or I currently work in a hotel." So to put it all together again, "Hi I'm Bob the Canadian. I'm in my late forties. I'm happily married with five children and I currently work as a high school teacher." good to be prepared for this. actually describe who you are really nicely. So if someone was to say, "What's your name?" You could say, "My name is Bob." If someone was to say, "Where are you from?" You could say, "I'm from Hamilton, Ontario." If someone was to say, "How old are you?" You could say, "I'm in my late forties." If someone was to say, "Are you married?" You could say, "I'm married with five children." If someone was to say, "What do you do for a living?" You could say, "I am a high school teacher." Well, Bob the Canadian here, I hope you enjoyed this short video. and the bell icon, and for sure share this video with someone. Bob the Canadian here, learn English with Bob the Canadian. Learn English words for size like: Tiny, Huge, Enormous, Gigantic Wow A New Video! I Am Back! Find out why I was gone! How to Say Sorry in English and Learn to Apologize in English | Video with Subtitles Weather Talk! Learn English Words and Phrases to Talk about the Weather | Video with Subtitles Fun Outside! Learn English Words and Phrases for Fun Things to do Outdoors Learn Hindi in 30 Minutes - ALL the Basics You Need Learn English with Music Videos and Songs | Ten Tips | With Subtitles Learn English Words & Phrases To Talk About Your Favourite Things! Fun at Home! Learn English Words and Phrases for Fun Things to Do At Home Learn how to use English words for time - Yesterday, Today, Tomorrow and more!